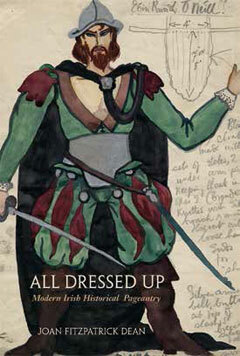 Irish theatre people (scholars, practitioners, audiences) might be interested in a very exciting new book by Joan Dean, called All Dressed Up: Modern Irish Historical Pageantry. It’s just been published in the US by Syracuse University Press. Dean writes about the growing popularity in the twentieth century of vast public pageants, which recreated scenes from Irish mythology and legend. Far from being separate from Irish theatre, these performances involved many important practitioners: Dean’s book includes some great discussions of work by Edwards and Mac Liammoir, Denis Johnston, Alice Milligan, Tomas Mac Anna, and many others. These large-scale public events required impressively complex arrangements in terms of choreography, production and design – and will be of great interest to anyone working in those areas. But they also give a fascinating insight into how the newly independent Irish state set out to perform itself, for its own citizens and for the outside world. The book also helps to fill in many gaps in our knowledge of Irish performance. We know quite a bit about Yeats’s Cuchulain plays, for example, but Dean’s book shows how those mythological figures were experienced on a broader scale in public pageantry. She also helps to fill in some of the gaps in our understanding of the relationships between the professional and amateur sectors in Ireland: these performances may have been directed and designed professionally but they were mostly performed by ordinary people. She also has much of interest to say about Catholicism and public spectacle in Ireland, especially in the first 30 years or so after independence. That’s a topic that people are perhaps reluctant to explore nowadays, but you can’t fully understand Irish theatre in the twentieth century without knowing how writers and directors were affected by the rituals associated with Catholicism. The book also has a lot to say about Edwards and Mac Liammoir, underlining the fact that their contribution to Irish performance extends far beyond the confines of the Gate Theatre. There is much more to be said about them, of course. We’re hosting a conference about the Gate Theatre soon, and we hope that this might help to encourage more work on that duo and their legacies. The book also places a lot of important contemporary developments in a proper context. There is a narrative out there that suggests that site-specific performance is new to Irish theatre, but Dean shows how our performance-makers have been using public spaces in creative ways for decades – using performance to both capture and challenge the meanings associated with, for example, Croke Park or the GPO. Dean brings us right up to Macnas, but it’s easy to see how a lot of today’s practice has roots or precedents in the performance she has re-discovered from earlier decades. The book also does much to emphasises the centrality of design to Irish theatre practice during the twentieth century – another topic that has been badly neglected. Ultimately, All Dressed Up is a great example of brilliant archival research being presented in readable and sophisticated fashion: the book manages the difficult balancing act of being academically rigorous and accessible. I hope it’s widely read by people with an interest in Irish theatre, and Irish culture more broadly. As we’ve been digitising the Abbey Theatre archive here at NUI Galway over the last couple of years, I’ve been reflecting a lot on what constitutes “useful” archival information. For example, I heard last year about a project to digitise theatre programmes, in which the researchers were going to omit the programmes’ advertisements, deeming them uninteresting. Yet I find the ads in Abbey programmes fascinating – if you know what the theatre thought it could sell its patrons in the 1930s (chocolate and engagement rings, mostly), you understand better their programming choices, for example. Something I’ve been noticing a lot in archives (not just the Abbey) is that when people are working on productions they can sometimes leave traces that have relatively little to do with the show itself. Hence you can find scripts that have phone messages, shopping lists, and the like. Sometimes these doodles are very interesting – there is a great one from the 1920s that appears to be a sketch of FJ McCormick, for instance. But these pics don’t seem to have any link at all with the show – or at least none that I could determine. Perhaps more research could answer that question. But they are also interesting in capturing the state of mind of the person who made the picture – you can sometimes get what appears to be a hint of boredom or frustration in these marginal doodles. It would be interesting to try to determine how many prompt scripts feature these kinds of insertions and to try to track that against the reputation of the show. This could be a complete waste of time, of course, but with hundreds of scripts in the Abbey Digital Archive, this kind of ‘big data’ question could be interesting. As far as I can tell, these kinds of doodles disappear from the 1990s onwards (lest any stage managers out there feel I am attacking their professionalism!)…. But they offer a great example of how interesting apparently useless archival information can be.